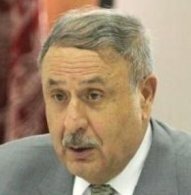 Tolo News: Afghanistan’s former minister of interior Gen. Noorul Haq Ulumi, who also leads a newly established political party, Afghanistan People’s National Front (Jabha-e-Milli Mardum-e-Afghanistan), on Wednesday entered the race for 2019 presidential elections. Bashir Ahmad Bezhan, head of Kabul Attendants, an civil society organization, analyst and journalist in profession, and Mohammad Naeem Ghayur are his running mates. Click here to read more (external link).